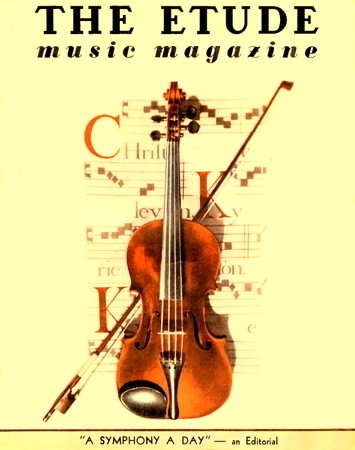 The Etude Magazine was published by the Theodore Presser Company between 1883 and 1957. 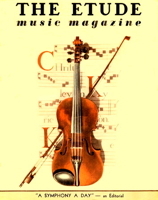 It was a staple for music teachers throughout the country, providing articles related to music history, new developments in music, and practical teaching techniques, as well as musical scores from the classics and new pieces for beginning to advanced students. Begun as an aid for piano teachers, the magazine grew to include information and literature for vocal and instrumental enthusiasts as well. Not only is the series important to the musician, but it provides an insight into the culture itself, including the impact of the development of the car, radio, and television, and expands to world music and the influence of world wars on that culture. The Etude, 43:532 (August 1925). Impressive Moravian Musical Customs. The Etude Magazine, 38: (October 1920). Issue devoted to American Indian music.